Opened in 1902, the Berlin Underground, also known as the U-Bahn is Germany’s most extensive network of its kind, serving a total of 170 stations and providing transport for over 400 million passengers across the East and the West side. Its ten operating lines and trademark yellow trains have become one of the most recognizable symbols of the city and, since the fall of the infamous Berlin wall in 1989, one of graffiti writers’ favourite painting surface. Inspired by the very roots of the art form, which dates back to the 1970s and the New York City subway system, over a hundred of these artists working today have been decorating wagons and stations with great dedication, turning Berlin underground into Europe’s most prominent graffiti scene, followed closely only by Paris. But it’s not just graffiti that live in the Berlin underground; over the years, the network has become a proper contemporary art gallery and an inspiration for the many creative individuals living and working in the German capital. Whether they’re residents or just visiting, the graffiti artists of the Berlin underground take great risks to paint the trains with their usually short-lived writings, throw-ups and pieces. They have to be quick and extremely careful – they have to paint within minutes, as that’s how long the train can possibly stay motionless at a given moment, and if they misjudge their timing, their lives could actually get in danger. What these guys do is pull the emergency break inside the train, so the driver has to go out and switch off the alarm on the outside of the train, which gives them time to paint simple, yet effective artworks. 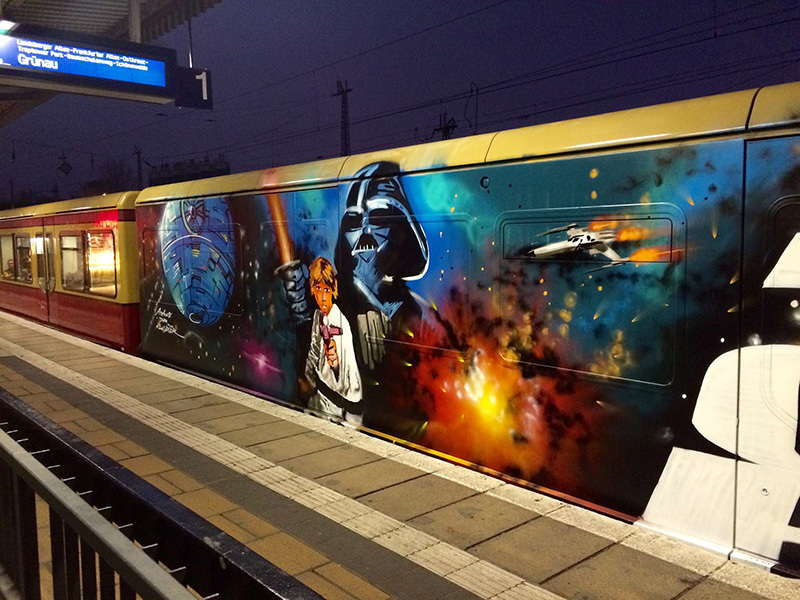 Once they succeed, they can enjoy the fact that their work will travel across the city for some 48 hours before it’s removed by The Berlin Transport Authority (BVG), which spends €670,000 annually on cleaning graffiti off of trains. Today, you can encounter pieces by the likes of GBR TRG, CHUK ARZT, 1UP, Funtom, Pawn, Share Reak, Esiak Cvas, the WMD crew, Spider, Nasty, Just and many more. While painting graffiti under these conditions certainly gets the blood rush faster and rises the level of excitement to the one above ground, there are other artists who take a much more relaxed approach, usually by creating a one-time, site-specific artwork of sorts. Their ideas are versatile and numerous, involving many kinds of artistic mediums, from chalk and performance, to video, posters, advertising campaigns and entire installations that occupy the spaces and walls of the Berlin Underground. Because of its high count of visitors, the U-bahn stations and trains make a perfect exhibition gallery, giving the artists an opportunity to share their creative ideas and make someone’s day a little bit brighter. The inspiration fountain of the city’s subway network seems inexhaustible and the results keep getting more and more interesting with every intervention. Among the intriguing figures from the rich artistic scene of Berlin, we have a few names that are all too familiar and whose work we’ve been following closely. Take the lovely Aïda Gómez and her playful transformations, most of which occur on the surface, yet she did not miss a chance to also leave her mark in the Berlin underground. Her Mind the Gap project, for instance, involved inserting colourful tiles to fill the holes in the walls, which kinda reminds us of the famous Tetris game. Speaking of playful, we have artist Brad Downey, who visited Berlin in 2010 and drew the hopscotch game, leading the passengers to play it on their way to the train. If you happened to be in the city somewhere during 2008 and you saw a curious character traveling the train tracks alongside your train, that would be the brainchild of German duo Wermke / Leinkauf, who had build a handcar by themselves and filmed their adventure as an arts project. They also used a sponge mounted onto a telescope pole to clean the windscreens of local transport vehicles which, surprisingly, wasn’t welcomed by the train drivers or the police. But the fun doesn’t stop there! 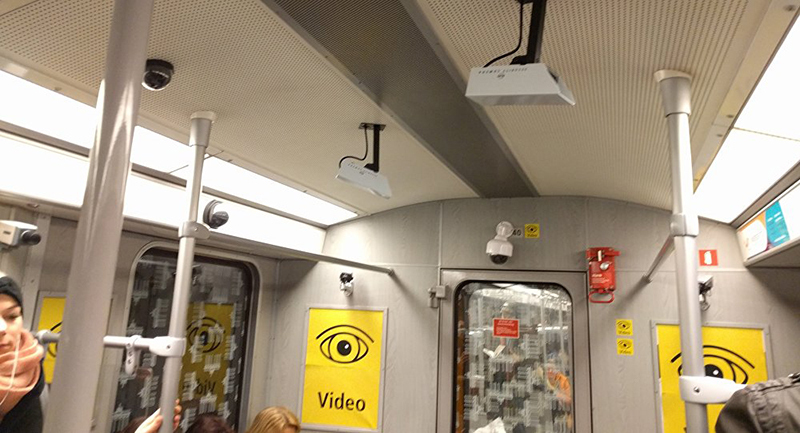 Just a month ago, for instance, in March 2016, the passengers of a U7 train of the Berlin Underground noticed an unusual set of surveillance cameras installed on the ceiling of the trains. It turned out to be a stunt by a certain someone going by the name of Fahgast, done as a comment on the recent increase in the numbers of cameras in the city’s subway system in order to ensure the security of the travellers. 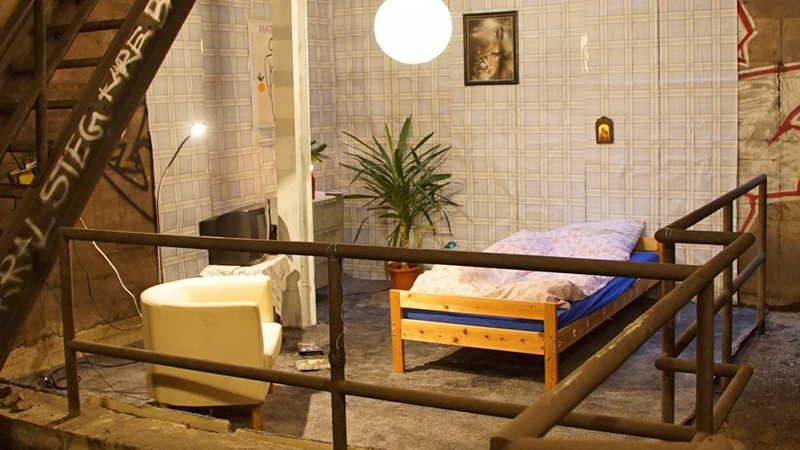 And just before that, in February, an entire apartment comprising Ikea furniture, television, carpets, wallpapers, plants and posters miraculously appeared in one of the most unusual places you can imagine: a tunnel of the U9 train, right between the stations of Schloßstraße and Rathaus Steglitz. No one knows who created it or how they got there, while the authorities announced an investigation following trespassing. The apartment was even available on the popular website Airbnb for a short while, with a price-per-night of just €23. Unfortunately, it’s been removed in the meantime. 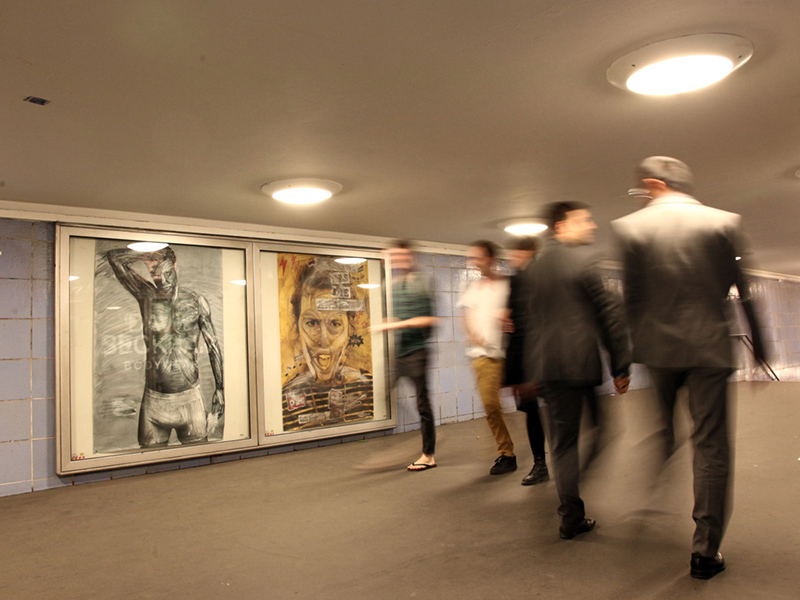 Of course, we cannot talk about the artistic interventions in the Berlin underground without mentioning our favourite culture jammer out there – Vermibus, who in 2012 had an entire solo exhibition up on display for the train-takers to check out. 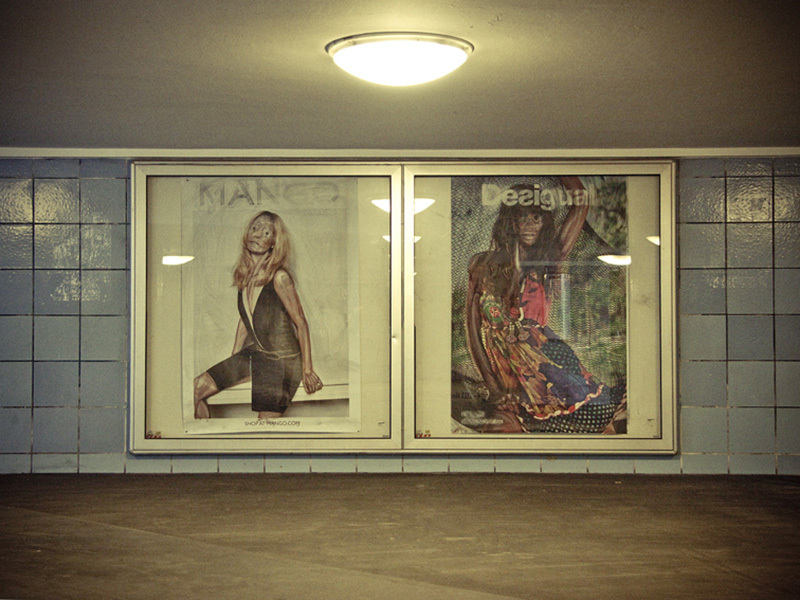 Taking place at the U8 station of Weinmeisterstrasse, the show introduced the artist as ”a critic of aesthetic value of the consumer society” and it featured his signature advertising posters inspired by the fashion industry, or rather the horrors of it. With a particular take on beauty, Vermibus revisits the promotional campaigns of a few famous brands and offers us a different kind of interpretation that is scary and captivating at the same time. As the Berlin Underground continues to prove itself as the fruitful playground for artists of all types and fields, we’re sure that the passengers can expect many more surprises in times to come, as they take the u-bahn to work or as they explore the wonderful city that is the German capital.